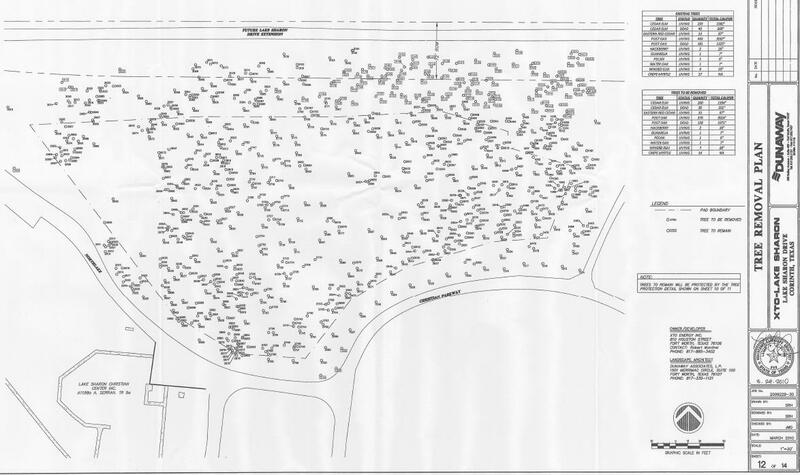 The below images show the location site in Google maps (North of the indicated road) and the tree removal plan, showing the planned removal of 801 trees. This ensures the site will be directly visible from the two bordering neighborhoods, Lake Sharon Estates and Cypress Pointe Estates , as well as Oakmont dr. 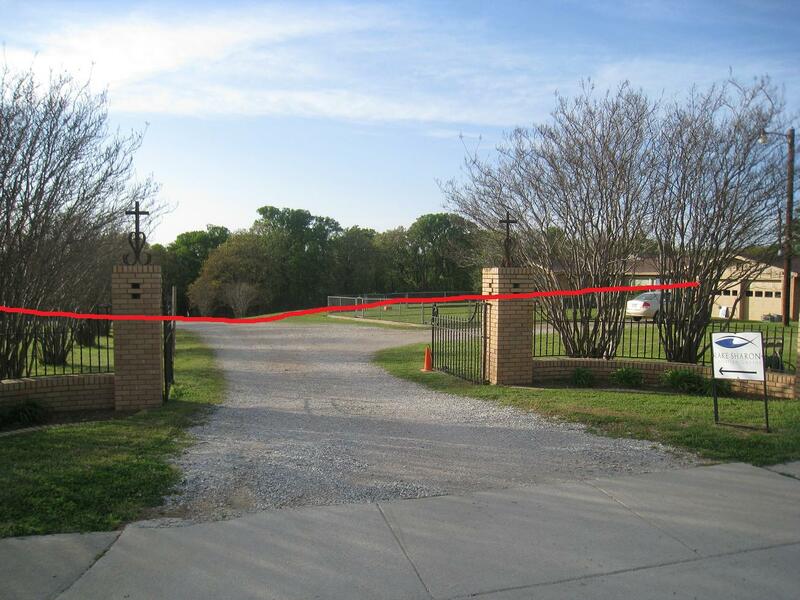 The below pictures were taken South property line of the Lake Sharon Christian Center and from Oakmont dr. at the front gate. The red line indicates the edge of the proposed site. According to the tree removal plan all trees behind this line will be cut down. It is just west of Lake Sharon…the road! Not west of Sharon Lake. It is exactly where the XTO rep said it would be on the map, just North of the Lake Sharon Christian Center. Once drilling is complete you would have to look hard to notice a difference. Drive around and view some of the completed sites. It is a good location for the site and good for the neighborhood. As far as the 801 trees…the removal of the those scrubs and cedars may improve allergies in the area! Most folks in the neighborhood have signed away…so what is the hold up? Obviously the people want it…so on with it. The faster you start the faster the rig comes down and the checks start flowing. JW, I’m sorry to say you appear to be as naive as I was about a month ago. Sure, money sounds great at first and we all would love extra cash. The reality is… you can expect small checks (if you get a check at all). It based on acreage. How many people even have an acre in the neighborhood? Hope a few lousy bucks and a measly signing bonus will cover the health issues that may be coming our way. One the other issue, the XTO rep sat in my neighbor’s front yard and told over a dozen of us that the well was going to be drilled on the West side of Lake Sharon. I continue to hear that same story from several people. I am not against drilling. I think we need to become energy independent. However, if this was such a great site, why does XTO need 10 variances (possibly 11 now) to be able to drill? Sounds like the wrong place to drill to me. Why in the middle of a neighborhood and close to 1800 children/staff in 2 large schools? If gas wells were so dangerous to students why would Guyer High School have two on their campus. With regard to variances if policies were written perfectly to cover every potential issue (totally unrealistic) then the city would not provide an avenue for variances. Most people talk about the number of variances but very few know the variances being asked for. Most posts at internet blogs like this have very little factual information. A description of the requested variances was added to the website. The comments on this Blog are opinions of residents and do not necessarily reflect the opinion of Corinth Cares. We fact check the content of the postings, and we will correct the postings when facts are disputed. I would like to encourage everybody to let us know of any incorrect facts posted on our blog. Unfortunately not everyone is getting paid for this nuisance. I live on the North side of Lake Sharon road and this rig will be right in my line of sight from my back yard. Not to mention the awful smell and loud noise that comes with a drilling operation! It doesn’t surprise me though that the City of Corinth would allow this rig to go up because they did the same thing farther down Lake Sharon road 2 years ago. If anyone remembers that rig, it was a mess. For me, the drilling itself isn’t as much as an issue as a company muscling in and asking for TEN variances while holding out the cash. If variances for the trucking of the toxic chemical wastes (a.k.a. “salt water”) are permitted, I predict a major toxic spill after a horrible accident on FM 2181 at the Oakmont/FM 2181 intersection. That’s the route to I-35 that trucks will be required to take. It’s already dangerous to turn left there, folks. 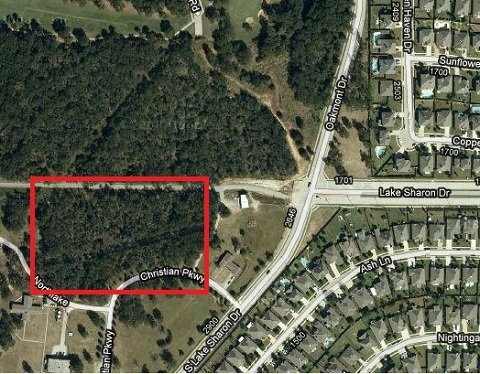 By February 2011 FM 2499 will put SIX LANES of traffic onto FM 2181 without a traffic light (TXDot still has to do their “warrant study” to see if there will be a need for a traffic signal). Can’t you see it? 12 hours of big unmarked trucks turning left at the intersection, holding up traffic and a new driver (my kid? yours?) rushing to get to Guyer High on time or rushing to get out of school with friends in the car. That folks is why PIPING the wastes out as our ordinances state they should MUST happen. It’s our lives. It’s Lake Lewisville our drinking water source that we are protecting. And BTW fracking wastes are radioactive. Google NY, EPA, Fracking and radioactive. A list of petition signatures was being passed around the meeting tonight. How many signatures will it take for the City of Corinth to listen to us and freeze the drilling until further studies are done much like Flower Mound just got?